Can anyone help in tracing this unique vessel? Built as a Torpedo Recovery Craft in 1943 -she was bought off the Admiralty in 1946 by Sir Harry Ricardo (1885-1974) who named her 'Caprella'. Used regularly until 1955 - she was sold to J Blackwell of Clitheroe Lancs. 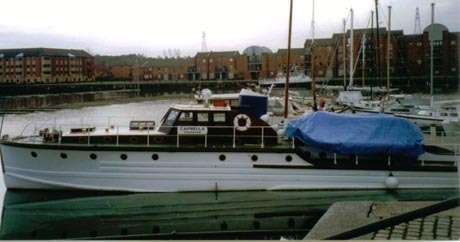 J Blackwell remarkably owned her until 1999 and she had regularly been reported at Glasson Dock (at least 1996-99). Sold on once more in 1999 - her new owners made passage for Ireland (late 1999) but she broke down and made for Fleetwood - from there the trail has gone cold. Can anyone fill in her history after 1999? Caprella was moved a few years ago by Andrew Rosthorn of Sealand Boat Deliveries (01254 705225). Photo of her move below. Thanks Christian. She is really drop dead gorgeous - for a boat. Only a number, not even a name. How shall posterity hear of thy fame? Could you date Ron Youngs picture of Caprella. I am interested in the appearance of OSPREY as she appears to be deteriorating when this picture is compared to garethep's recent pictures taken in Bowling Harbour a week or so ago. Ron did not date the photo, he does visit the forum though so perhaps he will let us know. See "Any Dog Boats Still Around", Jim photographed Osprey in May of last year at Dumbarton, looking OK. I hope she continues to be well maintained, as you say she looks a little sad (laid up?) in the most recent pictures but then again many boats do during the winter before their "sprucing up" in Spring. My reason for enquiring are along the lines of the possibility of there being two boats of almost identical conversion from the original RTTL superstructure. In asking for the date I wanted to check whether photographs were of a similar period or some time apart as this might aid in my enquiry. I am sure that there are not and I am certain that this would not have been overlooked by others better informed than I. While on the subject of Torpedo recovery craft, I note that two others are mentioned on the forum. One on the Thames owned by a forum member and one spotted in Irvine? a couple of years ago. Are these sister craft to Caprella and is there any more information or photographs that can be added to the forum to inform us? Andrew Rosthorn, Sealand Boat Deliveries. 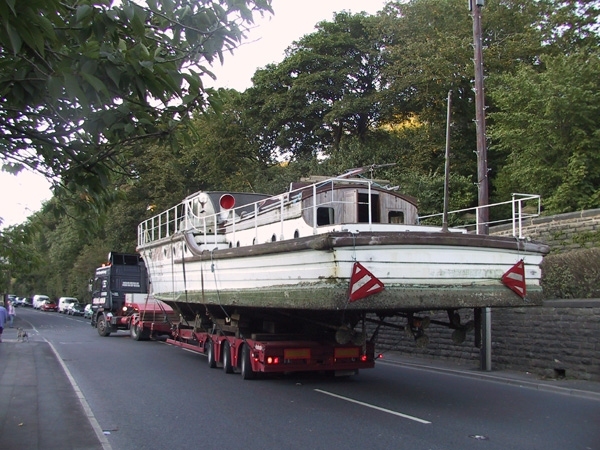 That's fantastic, just seen the link and pictures, so glad to see she has been saved, be great to see her underway again sometime soon, as mentioned, very sorry to hear about the former owners problems, not suprised he decided to move on.